The Nairobi Field Station (Nairobi FS) has an office in a rented apartment in Nairobi, and uses it as a research base. It covers both Kenya and Uganda. In FY2003, two faculty members and three graduate students were dispatched under the 21st Century COE Program to conduct education and/or research using the FS. In addition, one faculty member and two ASAFAS students, whose trips were financed by non-COE programs, utilized the Nairobi FS. OHTA Itaru (ASAFAS faculty member) visited Kenya and Tanzania from July 26 to September 15, with funding from a Toyota Foundation research grant. He carried out development and improvement of the FS, while conducting on-site education for graduate students (NAKAMURA Kyoko and SUN Xiaogang, both ASAFAS graduate students) and a joint research with the University of Nairobi. He also carried out fieldwork for "A Study on Social Changes in East African Pastoral Communities." In Tanzania, he conducted on-site education for KAWANISHI Yoichi (ASAFAS graduate student; enrolled in FY2002). TANAKA Jiro (ASAFAS faculty member) made an overseas trip from October 18 to November 18. After participating in the Field Station Cooperative Workshop held at Addis Ababa University in Ethiopia, he conducted on-site education for NAITO Naoki (ASAFAS graduate student; enrolled in FY1998). OHTA Itaru visited Ethiopia and Kenya from October 18 to November 6. After taking part in the Field Station Cooperative Workshop held at Addis Ababa University in Ethiopia, he also conducted on-site education for NAITO Naoki . NAKAMURA Kyoko (enrolled in FY1998); August 3 - October 22; 21st Century COE Program; Kenya; "Anthropological Study on Adornments of the Samburu and Changes in Their Age System"
SUN Xiaogang (enrolled as a third year student in FY2001); August 20 - October 3; Grant-in-Aid for Scientific Research; Kenya; "Socio-Ecological Study on Building a Sustainable Pastoral Model for East African Pastoral Communities"
NAITO Naoki (enrolled in FY1998); October 18 - November 16; Grant-in-Aid for Scientific Research; Kenya; "Anthropological Study on Livelihood Changes in African Pastoral Communities and the Dynamics of Ethnic Relationships"
SAKAI Kikuko (enrolled in FY1998); December 1 - February 29; 21st Century COE Program; Kenya; "A Study on the Relationship between the State and Market Merchants in Kenya: The Case of Machakos City"
SHIRAISHI Soichiro (enrolled in FY1998); December 7 - March 15; 21st Century COE Program; Uganda; "A Study on the Restructuring of the Livelihood Structure and Social Relations Brought About by Farming Commercialization in Small Farmers' Communities in East Africa"
(both ASAFAS graduate students) have a discussion with Kenyan research collaborators at the Nairobi FS. 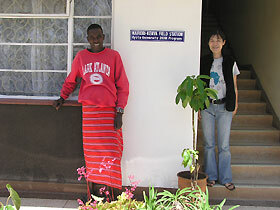 NAKAMURA Kyoko and a Samburu research collaborator stand at the entrance of the Nairobi FS. Since June 2003, the Nairobi FS has been using a rented apartment in Nairobi as a base for its education and research activities. During this fiscal year, a total of three faculty members and five graduate students utilized the field station. ASAFAS graduate students and faculty members and researchers of the University of Nairobi held joint seminars at the FS as the need arose. OHTA Itaru, taking advantage of his trips from July 26 - September 15 and October 18 - November 16, organized and improved the apartment. Specifically, he introduced a computer, telephone and terminal adapter, obtained a telephone number, made contract with a provider and connected the computer to the Internet by ISDN, thus developing and improving the electronic environment. He also improved the living environment by installing a desk, chairs, bookshelf and whiteboard, securing a power source to cope with blackouts, establishing a security system for times when nobody is at the FS, and waxing the floor. The Station is also used for storing equipment and materials needed for fieldwork. Nairobi FS's website is currently under construction, and will soon be available. OHTA Itaru held talks with the director of the Institute of African Studies of the University of Nairobi about the potential for future joint research, and specifically the implementation of a joint project. In the talks, it was agreed that the director would visit Japan in FY2004 from May 25 to June 7, during the Annual Meeting of Japan Association for African Studies (May 29 - 30). Taking the opportunity of the visit, exchanges between African and Japanese researchers will be further made and consideration will be given to signing an MOU between the Institute of African Studies of the University of Nairobi and ASAFAS. A research project entitled "For the Co-Existence of Refugees and Local People: A Recommendation from the Republic of Kenya" (November 2001 - October 2003) was undertaken jointly with the Institute of African Studies, subsidized by a research grant from the Toyota Foundation. One of the participants in the above project was a student in the master's course of the University of Nairobi. OHTA Itaru provided substantial guidance to the student by reading the master's thesis submitted by the student and having discussions with him at the Field Station. This student successfully completed the oral examination and defense of his thesis.